When selecting "Customized LED Installation" option Please allow 7-10 days for shipping, These pre-configured units are manually assembled and packed and can take some time to prepare. Add your choice of basic inserts, and/or LED lighting, to these multi-case selections. Recommended only for use as fixed display. Not as durable as colored units. Magnetic for use with Flex Iron enhanced bases. Metal for minis that have magnets on their bases. 2" wide high energy magnetic strip. 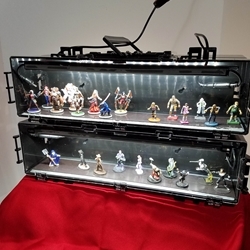 Strong enough to hold your miniatures in place while traveling to and from your favorite gaming locations. Combined with flex-iron allows you to magnetically secure your figures within an XCase unit. The ideal base insert for miniatures with pre-magnetized bases. Power cord to power LEDs. 1 long stud screw, 1 drywall plug + screw. Typically only one set of mounting screws required per hanging stack.